Most people would benefit from taking a general first aid class. The information in this article could be used hand in hand with conventional first aid and/or while waiting for an ambulance to arrive. First aid situations are basically for stabilizing the situation. If you have a serious condition, please go to the Emergency Room or dial 911. Herbal first aid does not take the place of conventional first aid or the care of a licensed physician. Herbs and natural products can be helpful in many ways to enhance first aid action. For instance, you may know from a first aid class that to stop bleeding you put pressure on the wound. An herb that could assist with this situation is yarrow. Yarrow (Achillea millefolium) could be placed on the wound as well as applying pressure to the wound to help stop bleeding, maybe a little more efficiently. 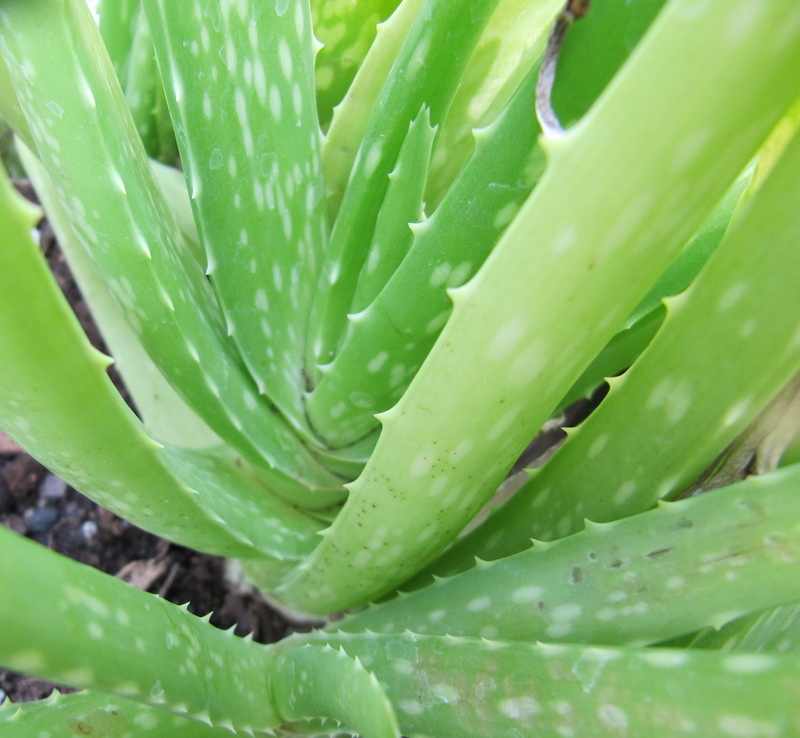 Your best plant medicine is going to come from the plants growing around you. Some herbs you can grow in your garden. They may already be your landscape plants. They may be in your kitchen cabinet or they may be found along a hiking trail, while you are out camping. Using fresh plant material is best, but some plants are not always in season. A supply of dried herbs or salves made from the herbs may be more convenient and would ensure that you have what you need when you need it. 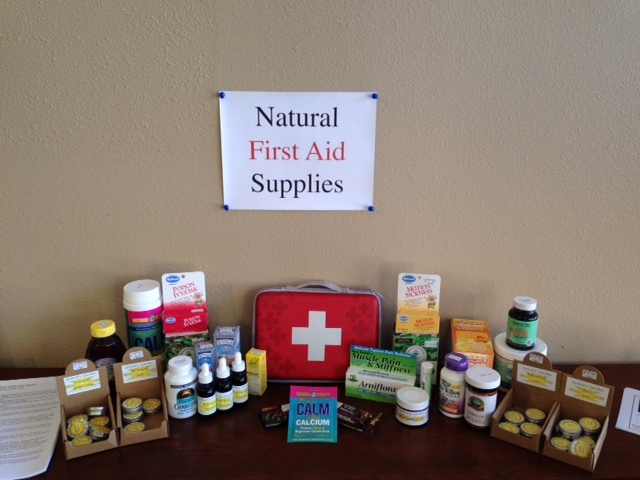 Natural supplies that can be added to your first aid kit will vary depending on your situation. At home you would certainly have more room for more supplies than you would if you were hiking in the wilderness. It also may be more important to have certain items depending on the risks that surround you. At any rate, you can tailor your kit to your needs. First Of All, Educate Yourself. Get to know the plants around you. Learn to identify them. 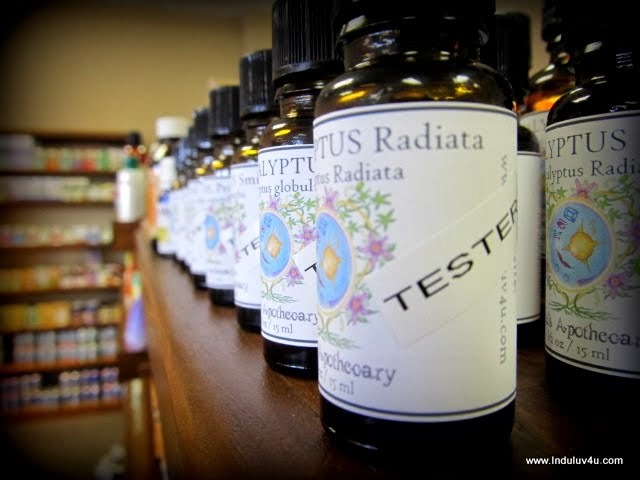 Learn their latin names and what they have been used for traditionally. Do your homework. Be able to positively identify plants over and over again and know what to look for. If you aren’t sure, don’t use it. Plant them, grow them, love them. Plan what to plant and where you will plant it. You may have a special bed for planting herbs or a whole garden. Many herbs can be grown in pots or planter boxes and protected from chemicals and animals. If you do any wildcrafting, be sure to ask permission of the land owner and don’t trespass. Harvest ethically, only when there is an abundance of the herb. Do not harvest all of the herb present. Leave some to go to seed and to propagate for the future. Ask permission of the plant and harvest with gratitude for the good medicine it has to offer. Carry water with you to offer back to the plants where you harvested. Teas for Fomentation or Compresses- Gauze is soaked in the tea and applied to the skin and kept warm with a hot water bottle or heating pad. Reapply several times. Make sure it is not too hot. Tea bags or re-useable tea bags can also be placed on the skin. Tinctures- stronger than tea- shelf life- 10 years. Infused oils, Salves, lotions for topical use and convenience. Poultice- made up of chopped or chewed fresh herb or powdered dry herb; clay or oatmeal; aloe; tincture, tea or warm water to mix and make a paste. Oatmeal will be soothing, the clay will help draw out poison or toxin. Who Should Use Which Herbs? Anyone can have a sensitivity to anything, so always be cautious until you know how you are going to react to something . Do your homework first on the herbs you want to use. Many herbs should not be used by pregnant women or if you are taking medications. Some herbs are good for children, some are not. Anything you drink or put on your skin can cause irritation, we are all different. Check with your doctor and or pharmacist. What Herbs Can I Plant? Aloe (Aloe barbadensis; A. vera) It grows in well drained soil low in organic matter. This succulent thrives on little attention. Avoid over-watering and move indoors before temps get into the 40s during winter. It likes the sun, but a little shade during the day is good. Cut a piece of fresh aloe leaf as needed. Soothing gel is great for burns, cuts and wounds. I will add a slice of the gel under bandaid for blisters or burns. Fresh is best. Calendula (Calendula officinalis) I think it grows better in fall in Central Texas. It doesn’t do so well in the Texas summer heat. I replant it each year. Dry flowers for tea. Make a salve or buy a salve. 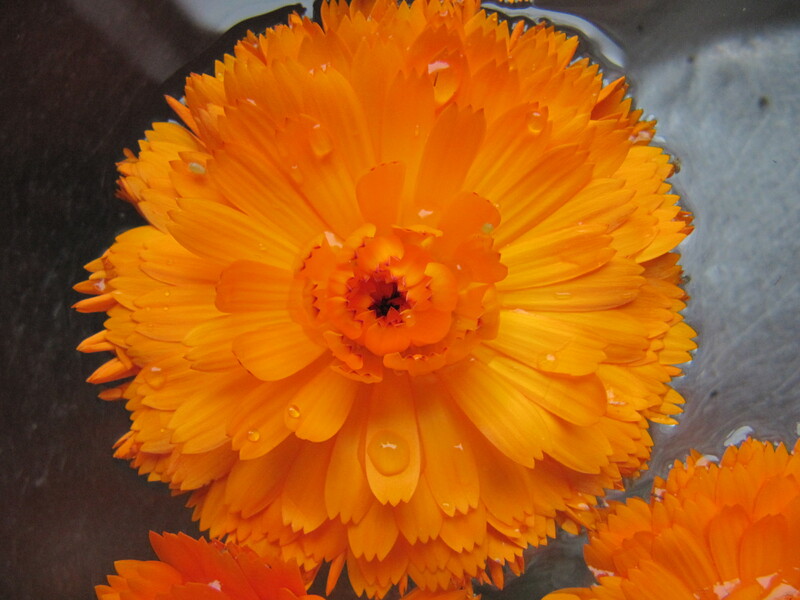 Calendula flowers are emollient, anti-inflammatory, antispasmodic; astringent (tightens and tonifies tissues); anti-microbial; anti-fungal and diaphoretic (to help you sweat to reduce fever.) It is beneficial for skin ailments and healing the digestive tract. Comfrey (Symphytum officianale) (Also known as knitbone.) You can grow it in a pot, but use a large pot, because the root needs lots of room. It is happier in the ground and it likes to have some shade. It does well in poor soil and holds up well in winter, so you don’t have to worry about it freezing. It likes regular water. Pyrrolizidine alkaloids are found in the root and in fresh leaves, but not in dried leaves. However, the FDA still requires a warning not to use it for more than 10 days in a row and not to take it internally, because it may cause liver damage and not to use it if you are pregnant or have liver damage. 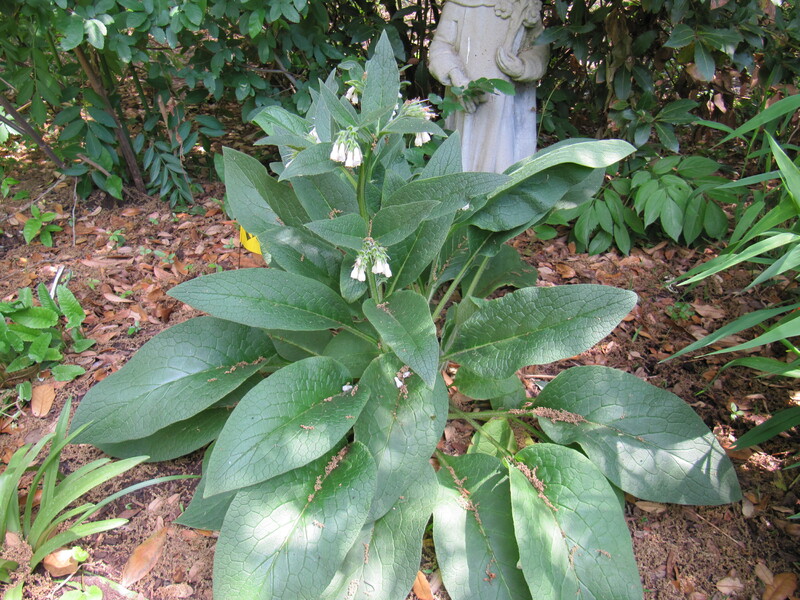 Comfrey has been traditionally used for broken bones, sprains, bruises, arthritis, and bronchitis. Use as a poultice or fomentation. First aid use is primarily for trauma or burns. Do not use on deep, open wounds or puncture wounds, because an abscess can form below a quickly healed surface. Sage (Salvia officinalis) This is an easy to grow perennial. It is drought tolerant and likes sun. 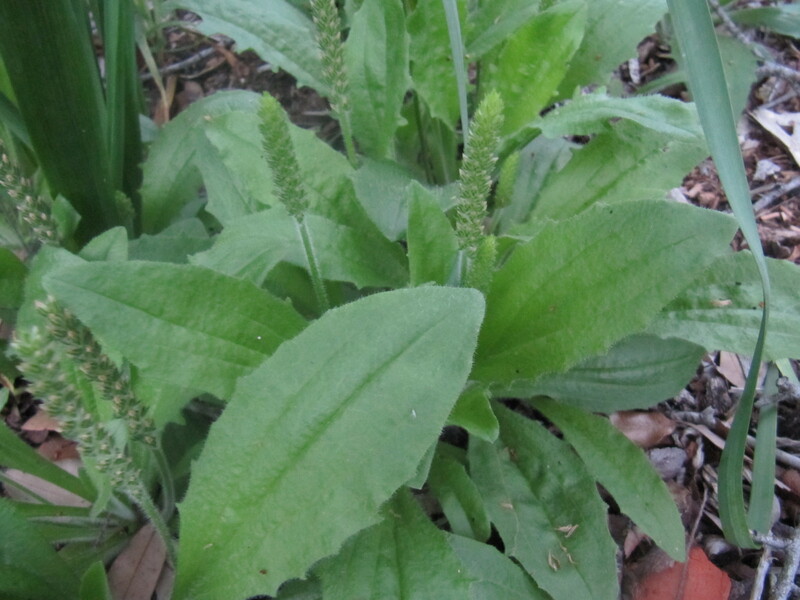 The leaves used for external wound washes for abrasions, contusions or inflamed skin. Gargle with sage tea, then swallow for sore throat and congestion. 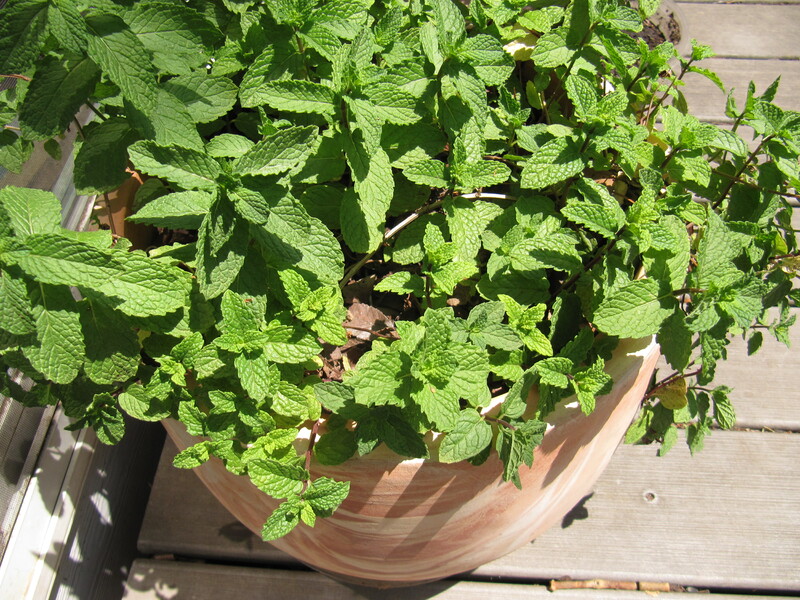 Peppermint (Mentha piperita) This is another easy to grow herb. It is best to grow it in a pot because it can take over a bed in no time. Peppermint likes steady water. Mints are one of the oldest and most reliable herbal remedies. Spearmint is not as strong as peppermint, so it may be preferable to children. It is great for digestion. Peppermint is also a helpful herbal catalyst, so drinking a cup of peppermint tea before taking other herbs opens the circulation and potentiates their action. 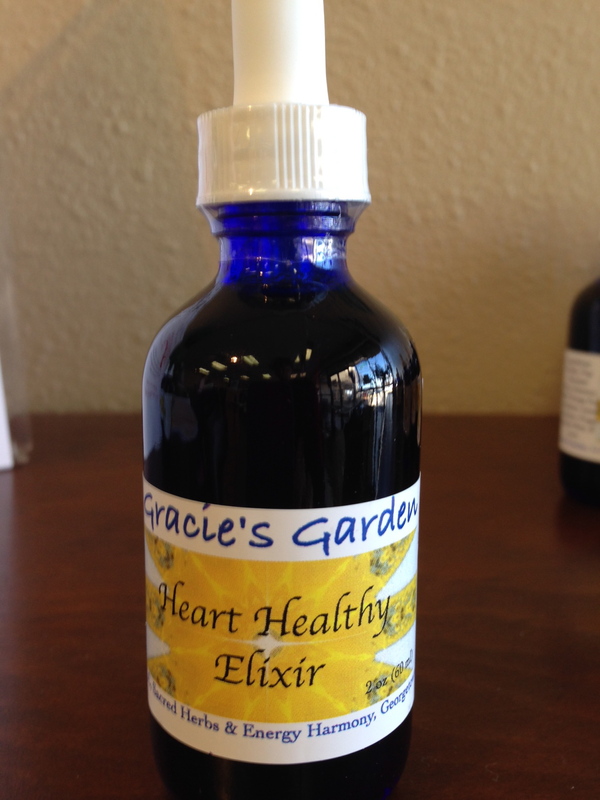 It helps with gas, nausea, heartburn, bronchitis, colds & flu. Yarrow (Achillea millefolium) It can overtake the flower bed easily. The medicine tends to be stronger if the soil is poor and the plant has to struggle a little. White or pale pink flowers and leaves are used. It will grow well in sun or some shade. 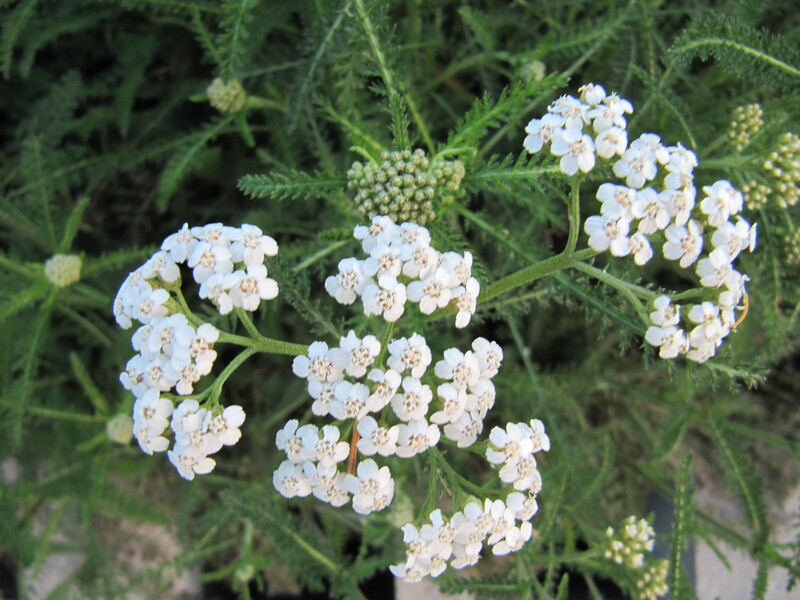 The shaded yarrow tends to have taller stalks and it spreads through roots and seeds. It was traditionally used as a fever reducer, blood pressure regulator, astringent, hemostatic, anti-inflammatory, diuretic, anti-microbial, antiviral and bitter. First aid use is primarily to stop bleeding using a spit poultice. 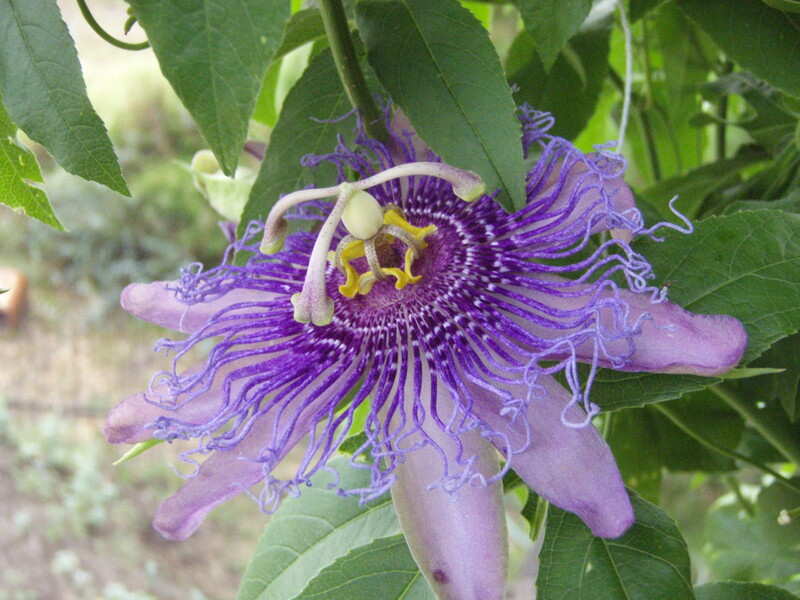 Passionvine or Passionflower (Passiflora incarnata) This is an easy vine to grow, but plant enough for the butterfly caterpillars to eat. Once you get it started you will have it everywhere. The Native plant species can be found on hiking trails around here. The vine and flowers are used for anxiety, insomnia, and have a calming effect. It can be consumed in tincture form, smoked or simply make a tea with it. It is a Nervine, so has a calming effect, but typically it won’t knock you out. This falls under first aid, because if you are in a trauma situation, people may tend to get anxious or have trouble sleeping. It is anti-spasmodic, can help with stomach ache or diarrhea; painful menstruation and mild pain relief. Fennel (Foeniculum vulgare) It is easy to grow in your garden. Remember to plant enough for the butterflies. Seeds were traditionally used for relief of gas, indigestion and for fresh breath. These are just a few herbs that are easy to grow and do well in Central Texas. What Other Natural Products Should I Add To My Kit? *All Purpose Salve [Gracie’s Garden]: suggested for minor burns, rashes, kin ulcers, bites,stings, cuts, bruises, inflamed skin or fractures. Do not use on a deep wound. Contains: Organic Extra Virgin Olive Oil, Beeswax, Non- GMO Vitamin E, Calendula, Plantain, Comfrey, Tea tree essential oil & Love. Baking Soda: heartburn, urinary tract infection (drink a pinch in a glass of water); topically added to a poultice for spider bites etc. *Burn Salve [Gracie’s Garden]: soothing to scrapes, burns and sunburns, contains: Organic Extra Virgin Olive Oil, Beeswax, Non-GMO Vitamin E, tomato leaves & flowers, calendula flowers, plantain, oregano, & lavender essential oil & Love. *InflamAway Salve [Gracie’s Garden]: suggested for inflamed conditions, bruising, anti-fungal; contains: Organic Extra Virgin Olive Oil, Beeswax, Non-GMO Vitamin E, arnica, chaparral, ginger & rosemary & Love. *Thieves Oil Salve [Gracie’s Garden]: ready to apply to the soles of the feet or chest to chase away a cough or prevent the black plague. It is also great as a first aid salve. What Other First Aid Supplies Should I Have? Use small containers to add small portions to your first aid kit. Be sure to make sure everything is labeled in your first aid kit, for safety. Check and replace items at least annually. Make your kit work for you with the items you need. Put plenty of thought into it. First Aid kits can be purchased at your favorite pharmacy and usually have the basic supplies along with a quick reference guide. Natural products, Indu’s Apothecary Essential Oils and Gracie’s Garden products can be purchased at Georgia’s Naturals, 3010 Williams Dr. Suite 105, Georgetown, TX. This information is based on traditional uses of herbs, no claims are made. Nothing in this handout is meant to diagnose, treat, or cure any disease. This information should never take the place of a Licensed Physician. If you have an emergency dial 911 and/or go to the emergency room. This is for educational purposes only. This entry was posted in Uncategorized and tagged aloe, calendula, comfrey, first aid remedies, herbal first aid, natural first aid, passionvine, peppermint, plantain, yarrow. Bookmark the permalink. This is going to be so incredibly useful as I write my next novel. Thank you for sharing!